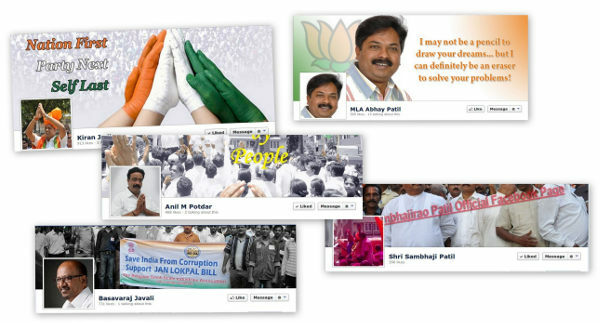 Many days have not passed when we had politicians and political parties from Belgaum showcasing themselves online through social networking sites like facebook. Having fan pages or profiles of individuals or parties going left and right to lure the younger generation with all types of possible campaigns and making the best use of the online medium to gather votes. Now, that the duty of voters is over and have seen the politicians taking the centre stage after winning, where have these pages disappeared ?? Any of us have seen any regular updates on them ?? I wonder if anybody had a positive answer to this. So shall we conclude to understand the intention of having these online campaigns meant for. It’s an opportunity, but for only who can DARE…!! Undoubtedly, the online medium is an opportunity to showcase the development work that one takes up in his or her constituency. Creating a page or a community on social networking science doesn’t need out of the box thinking. If each elected person, creates this and uses that opportunity to discuss issues relating to his area and also to show the development work that takes place accordingly. But, alas this is an opportunity for them, who can DARE to come out in public through such a medium and have the GUTS to face people through it. It would not solve all the issues of the society, but certainly will be an aid to public and also an opportunity to the public representatives to build their agenda. With majority of our population being projected as the younger lot in the days to come, is it not a great opportunity for the politicians to talk about development through the medium the younger generation are more conversant with. I sincerely wish, someone from any of the regional or national political parties read this somewhere (as if any one recommends, they would not take it seriously enough) and think on the same and dare to face the public to listen to them and put efforts to set right things. About the Author: Suhas Rajput is a Training & Placement Officer, Karnatak Law Society, Belgaum. Well written and i do agree with all the above points. They did all to gain SYMPATHY from the voters during. Post elections none of them are even seen, may b they are back to business of recollecting their investments made for elections. Look at the sorry state of our city and the APATHY faced by all we fellow belgaumites. They will play the blame game but we common man face the music being at the receiving end. We aren’t asking for luxury but just basic needs to be fulfilled. Good roads, clean drinking water, stop load-shedding, clean footpaths. You rightly pointed out. Our politicians are getting intelligent with evolving digital world. At the end of day they want to take the voters (uneducated as well as educated) using the old and new tricks. We had seen the local politicians conducting matches, entertainment fest, Guruvandana programs, road repair works (with photo sessions!)…. all that is gone after elections. Be ready to face them once again when elections are around.